Size: 6.0" x 3.1" x 1.3"
• The keyboard looks like a Klixon™ keyboard manufactured by TI but was another design. 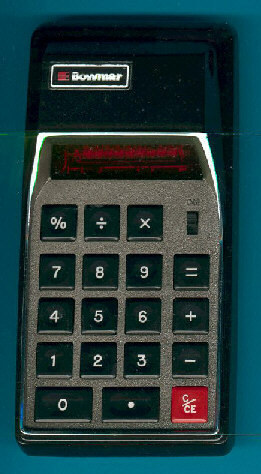 • The calculator chip inside was from the indepenent supplier Western Digital. • Actually a LC1552B was used here, a chip supporting a 4-key memory. And this in a calculator without any memory! Compare it with the Montgomery Ward P8M or the Radio Shack EC-300 using an identical chip. New York based company Melcor made similar experiences, don't miss the Melcor Model 380. Don't miss the similar looking but yet completely different Sears Digi·matic 8.